ARP Synthesisers was started by the engineer and musical enthusiast Alan Robert Pearlman – hence ‘ARP’ – in 1970 in Lexington, Massachusetts, USA. Previous to ARP, Pearlman had worked as an engineer at NASA and ran his own company Nexus Research laboratory Inc., a manufacturer of op-amps (precision circuits used in amplifiers and test equipment) which he sold in 1967 to fund the launch of the ARP company in 1969. The inspiration for ARP came after he played with both Moog and Buchla synthesisers and being unimpressed by the tuning instability of the oscillators and lack of commercial focus – especially the keyboard-less Buchla Box – and became determined to produce a stable, friendly, commercial electronic instrument. Despite the fact that the 2500 proved to be an advanced, reliable and user-friendly machine with much more stable and superior oscillators to the Moog, it was not commercially successful, selling only approximately 100 units. 1003 dual envelope generator This module contains two ADSR envelope generators (actually labeled “Attack”, “Initial Decay”, “Sustain”, and “Final Decay”), each switchable between single or multiple triggering. There is a manual gate button as well as a front panel input for gate/trigger and a back panel input for a sustain pedal. 1004 VCO A Voltage Controlled Oscillator with a range from 0.03Hz to 16kHz, this module can function as a VCO or an LFO. It features separate outputs for each of its five waveforms (sine, triangle, square, sawtooth, and pulse) and 6 CV (control voltage) inputs, as well as a CV input for Pulse Width Modulation. 1004p VCO This module is the same as the 1004, except each waveform has its own attenuation knob for mixing all the waveforms together. There is a separate output to for the mixed waveforms. 1004r VCO This module is the same as the 1004, except each waveform has its own rocker switch to route any or all of the waveforms to an extra mix output. 1004t VCO This module is the same as the 1004r, except it uses toggle switches. 1005 VCA andRing Modulator This module is half Voltage Controlled Amplifier and half Balanced (Ring) Modulator. It is switchable between linear or exponential voltage control, and features 11 inputs, 3 outputs, and illuminated push-buttons. 1012 Convenience Module This module routes two jack inputs to any of the upper ten lines of the lower matrix. (Remember, most of the patching for this instrument is done from these matrix sliders). 1016 dual noise generators This module features two random voltage generators outputting white or pink noise and two slow sample-and-hold circuits, four outputs in all. 1023 dual VCO Both oscillators feature the same waveforms as 1004 with a switch for high and low frequency ranges. There are a total of 10 control inputs and 2 audio outputs. 1026 Preset Voltage module This module contains eight manually or sequencer-driven gated control-voltages, each with two knobs sending control voltages to separate outputs. It can be connected, via the rear panel, to module 1027 Sequencer or module 1050 Mix-Sequencer. 1027 Sequencer This is a 10X3 sequencer with 14 outputs (including 10 separate position/step gates), 6 inputs, buttons for step and reset, and a knobs for pulse repetition/width, which controls the silence between the steps. 1033 Dual Delayed-Trigger Envelope Generator This module is the same as the 1003 ADSR module except it has two more knobs to control gate delay. 1046 quad envelope generator This module is basically a 1003 and a 1033 combined into one module. 1047 Multimode Filter / Resonator This module features 15 inputs, 4 outputs and an overload warning light. 1050 Mix-Sequencer This module features two 4X1 mixers with illuminated on/off buttons. 3001 Keyboard This keyboard features a 5-octave, 61-note (C-C) keyboard with the bottom two octaves (C-B) reverse colored to show the keyboard split. The top half of the keyboard is duophonic. There are separate CV (1v/octave), gate, and trigger outputs for each side of the split, as well as separate panels on either side of the keyboard with controls for portamento, tuning, and pitch interval.
? Dual-Manual Keyboard Two 3001s, one on top of the other, with the bottom octave (C-B) or two octaves (C-B) of the top keyboard reverse colored to show the split. “ARP 2600 The ultimate professional-quality portable synthesizer Equally at home in the electronic music studio or on stage, the ARP 2600 provides the incredible new sounds in today’s leading rock bands The 2600 is also owned by many of the most prestigious universities and music schools in the world Powerful. dependable, and easy to play. the 2600 can be played without patchcords or modified with patch cords. This arrangement provides maximum speed and convenience for live performance applications, as well as total programming flexibility for teaching, research composition and recording. An pre-wired patch connection(s) can be overridden by simply inserting a patchcord into the appropriate jack on the front panel. 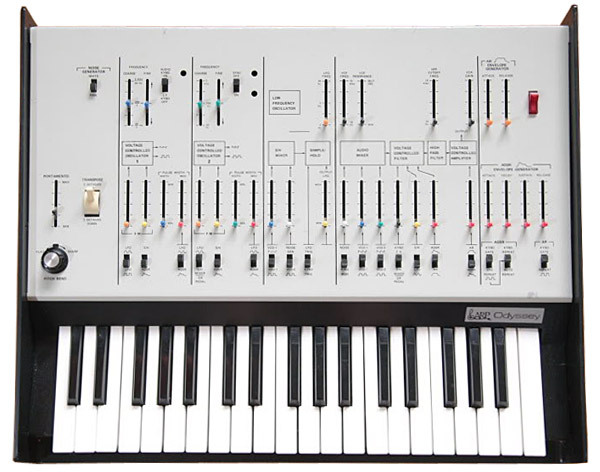 By the mid-1970s ARP had become the dominant synthesiser manufacturer, with a 40 percent share of the $25 million market. 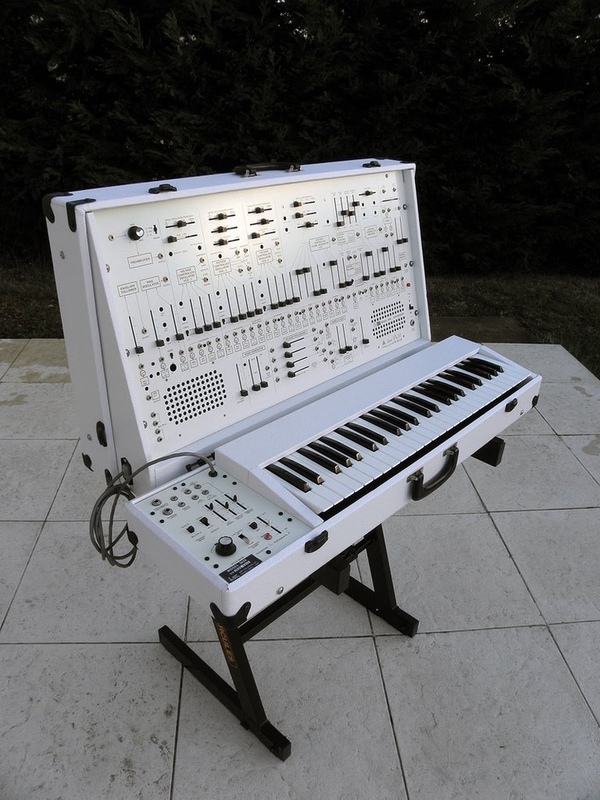 This was due to Pearlman’s gift for publicity – the ARP2500 famously starred in the film ‘Close Encounters of the Third Kind’ (1977) as well as product endorsements by famous rock starts; Stevie Wonder, Pete Townsend, Herbie Hanckock and so-on – and the advent of reliable, simpler, commercial instrument designs such as the ARP 2800 ‘Odyssey’ in 1972. 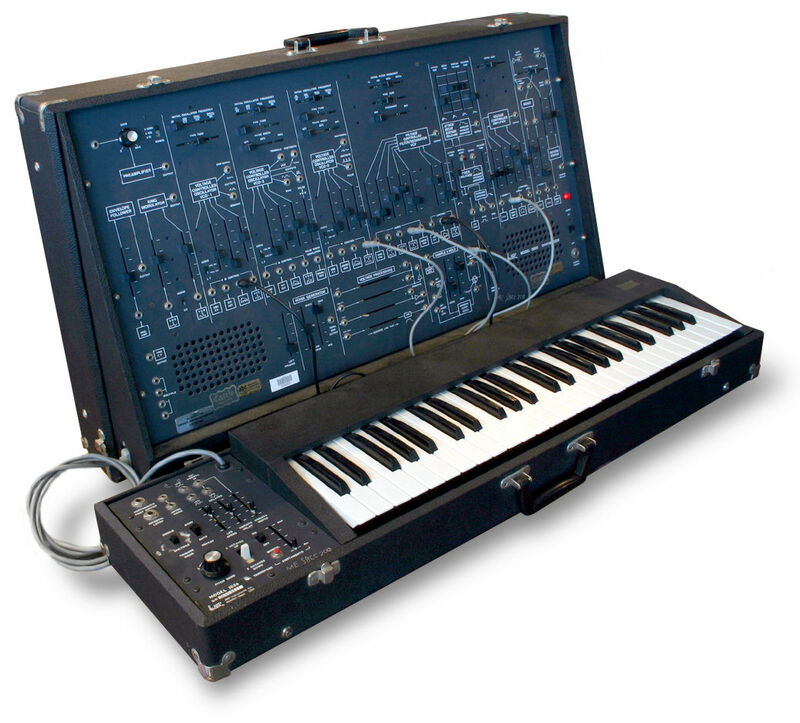 The Odyssey was ARP’s response to Moog’s ‘Minimoog’; a portable, user-friendly, affordable performance synthesiser; essentially a scaled down version of the 2600 with built in keyboard – a form that was to dominate the synthesiser market for the next twenty years or so. 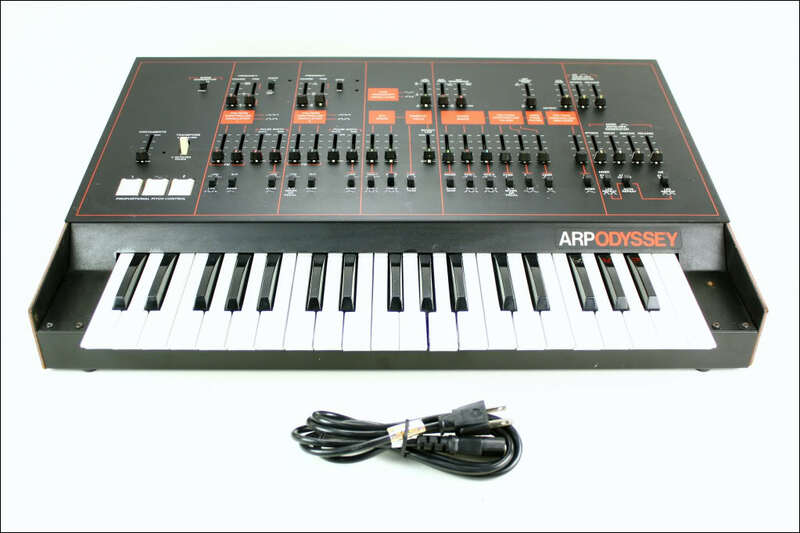 The Odyssey was equipped with two oscillators and was one of the first synthesisers to have duo-phonic capabilities. Unlike the 2600 there were no patch ports, instead all of the modules were hard wired and routable and controllable via sliders and button son the front panel. ‘Modules’ consisted of two Voltage Controlled Oscillators (switchable between sawtooth, square, and pulse waveforms) a resonant low-pass filter, a non-resonant high-pass filter, Ring Modulator, noise generator (pink/white) ADSR and AR envelopes, a triangle and square wave LFO, and a sample-and-hold function. The later Version III model had a variable expression keyboard allowing flattening or sharpening of the pitch and the addition of vibrato depending on key pressure and position. 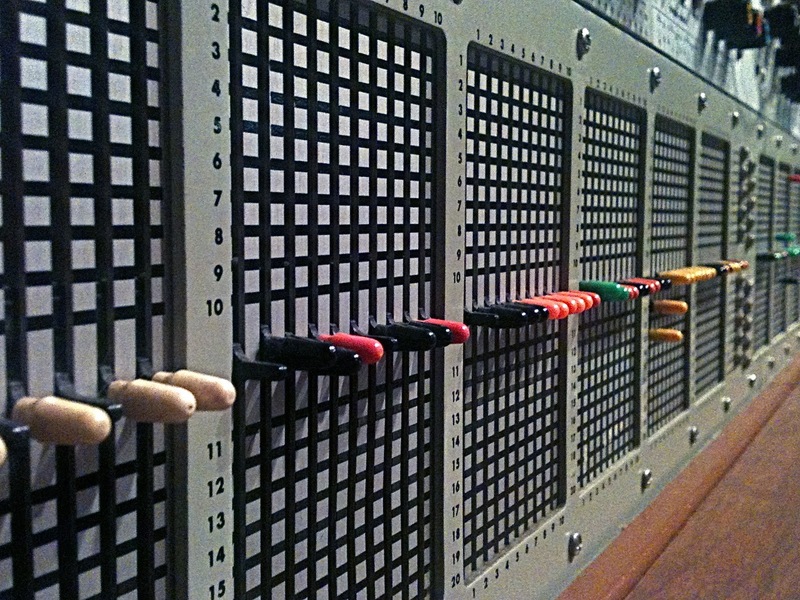 1969 – ARP 2002 Almost identical to the ARP 2500, except that the upper switch matrix had 10 buses instead of 20. The demise of ARP Instruments was brought about by disorganised management and the decision to invest heavily in a guitar style synthesiser, the SRP Avatar. Although this was an innovative and groundbreaking instrument it failed to sell and ARP were never able to recoup the development costs. 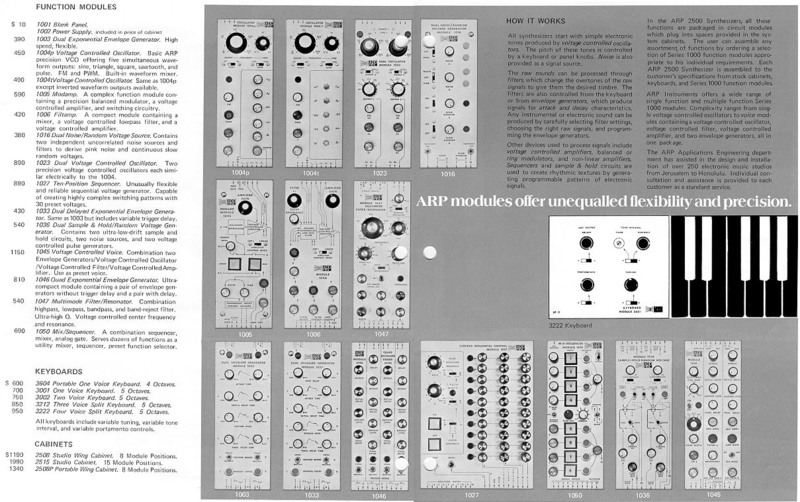 ARP filed for bankruptcy in 1981. I have a couple of the amazing (what became) Fender Chroma Polaris synths (presumed dead in storage). They were analog, but with digital memory & MIDI. I wanted to mention, you really should put in a (Tom) Oberheim page, because even before he sold out to Roland or whoever, his was the first portable/reasonable polyphonic synth 4 & 8 note versions), I mean of the known Moog, ARP, etc., that were used in pop, jazz, rock, etc.—at that time (1970s+). I also have a tremendous set of PAiA modules that was all the sounds, if monophonic, for pennies on the dollars of other brands. Really PAiA & Aries deserve mention, in that they were affordable (and even kit versions–I was a hobbyist, so built them, but you could buy them already built). And you know what? Most folks knew ‘ARP,’ the brand of his initials, but not his NAME, Arnold Pearlman. I supposed Bob Moog (and even Buchla & Oberheim, etc.) was luckier to have an odder name. I drooled for that stuff, back in the 1970s into the 80s. And in the last decade, many folks are once again getting the musicvirus, that can’t leave your spine, for modular synths. And it’s about time. 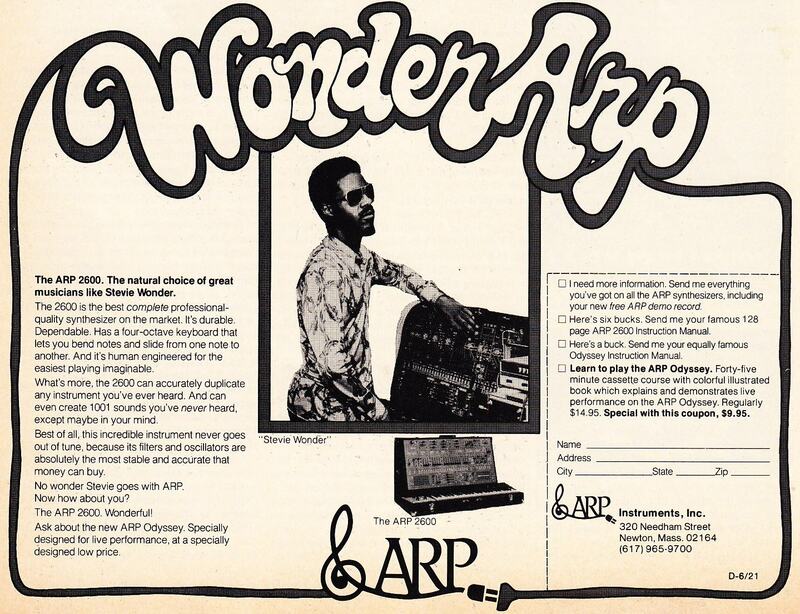 My uncle actually used to work in R&D for ARP in the mid 70s, right up until they were bought out by CBS/Fender Rhodes in 1981. He has a ton of working prototypes of both Chroma and Polaris synths in his basement. He also had a great 8 channel keyboard mixer that ARP made called a Performance Series 8…it was a beast of a console for an 8 channel keyboard mixer (about the size of my Allen & Heath MixWizard console…maybe a bit bigger) but it had an onboard graphic EQ for mains and aux outs, and also had a built in bucket-brigade analog delay. After he left ARP, he worked for Rodger’s organs, which was a subsidiary of Roland up until he retired. I’d like to second the suggestion to have a PAIA electronics category here. Many of us built those kits when it was impossible to financially to procure an ARP or Moog.